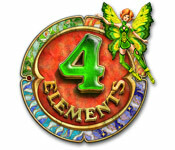 4 Elements is a hidden object, match-3, and spot-the-difference game in a classic fantasy setting. In the course of the game, you restore fantasy locations aligned with each of the four elements of air, earth/wood, fire, and water. This page shows the fantasy artwork of the hidden object game locations.